Most people understand that if you are fat it can lead to many other serious health problems. In order to get our bodies back in shape we must eat the right foods, get enough sleep and exercise. You can find that information on just about any fitness magazine, book and website. But how does this happen? Nutritionists and Doctors have published this information in the past, however, most people may not be familiar with the vocabulary and language these professionals use. Now there is a book that explains how our bodies react to diet and exercise in layman’s terms. The Layperson’s Guide to Exercise, Diet & Supplements , by athlete and businessman Daniel J. Shamy, is a comprehensive guide to everything fitness. This book was written to provide first-hand insight into how our bodies work. Daniel Shamy uses his experience conditioning his body to compete in different sports to explain dieting and nutrition in a way for anyone to understand. After reading “The Layperson’s Guide to Exercise, Diet & Supplements ,” I came away with a better understanding of how my body works and the path that I must take in order to maintain a healthy lifestyle. If you are ready to get your body in shape and feel healthy, young and strong, this is the only fitness book that you have to read. I’ve tried several different diets and exercise programs, and taken all kinds of supplements. I also understand that our bodies react differently to the food we eat, supplements we take and the physical activity we participate in. Trial and error with diet and exercise can get frustrating and will not help you reach your goals quickly. Shamy provides all the information you need in order to find your path to a healthier you. 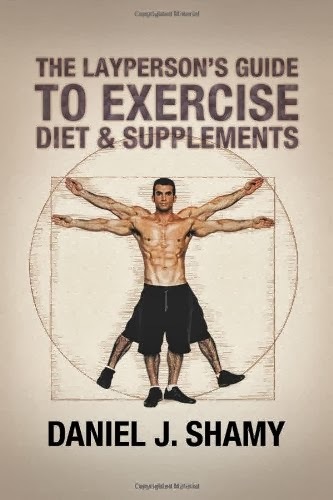 “The Layperson’s Guide to Exercise, Diet & Supplements,” can be purchased on amazon.com, barnesandnoble.com, xlibris.com and at your local book store. Born in Beiruit, Lebanon and raised outside of Atlantic City, Daniel J. Shamy was trained by his father to be a competitive athlete since he could walk, competing in a variety of sports requiring different physical conditioning. Shamy did not want to be a professional athlete; rather, his dreams were in following his father’s footsteps in business. At 37 years old, Shamy today owns a multitude of successful businesses in diversified industries. Shamy also acts as managing partner of a midsized law firm in Florida, co-founded in 2002. Despite his love for business, he presently remains active in sports and training. *Disclosure: I received a copy of “The Layperson’s Guide to Exercise, Diet &Supplements,” in exchange for this review. All opinions are accurate and 100% mine.